House Democrats on Wednesday night released a January 2009 email exchange between Hillary Clinton and former Secretary of State Colin Powell containing advice on how to use a personal mobile device and email system as the nation’s top diplomat. One day after President Obama secured permission to keep his BlackBerry as president on Jan. 22, 2009, Clinton emailed Powell asking about restrictions on his email practices while he served in the State Department under former President George W. Bush. "President Obama has struck a blow for berry addicts like us," Clinton wrote. "I just have to figure out how to bring along the State Dept." Powell replied that he did not have a BlackBerry, but instead used a personal computer hooked up to a private phone line that enabled him to correspond with friends, world leaders, and senior administration officials "without it going through the State Department servers." The "real issue," he said, involved personal devices. "The issue was [Diplomatic Security] would not allow them into the secure spaces, especially up your way. When I asked why not they gave me all this nonsense about how they gave out signals and could be read by spies, etc. … NSA/CIA wouldn’t back off. So, we just went about our business and stopped asking. I had an ancient version of a PDA and used it," he wrote. "However, there is a real danger. If it is public that you have a BlackBerry and it [is] government and you are using it, government or not, to do business, it may become an official record and subject to the law," he continued. "Be very careful. I got around it all by not saying much and not using systems that captured data." National security and intelligence attorney Brad Moss said the conversation could be interpreted as a primer from Powell on how to avoid the Freedom of Information Act. "He basically told [Clinton] that using a private email system could be a mechanism to minimize the extent to which her communications would be captured on State Department’s servers," Moss told the Washington Free Beacon. "That certainly could be viewed as advice on how to skirt the law." Still, Moss said, the exchange offers circumstantial evidence that Clinton "knew how to minimize her exposure to records retention." "When combined with her surprising ignorance of the State’s archiving system, or lack thereof, it reflects poorly on her judgment," he said. Democrats on the House Oversight Committee released the exchanges in an attempt to deflect criticisms of Clinton over her use of a private email server while serving as secretary of state. Rep. Elijah Cummings (D., Md. ), the ranking member on the committee, said in a statement Wednesday that the email exchange "illustrates the longstanding problem that no secretary of state ever used an official unclassified email account until the current secretary of state." During FBI questioning regarding her email practices, Clinton told investigators that Powell had advised her to use a personal account. 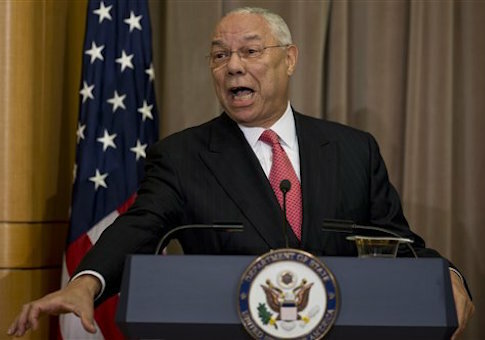 Powell has refuted claims that he encouraged Clinton to use a personal account, however. "Her people have been trying to pin it on me," Powell told People Magazine last month. "She was using [the private email server] for a year before I sent her a memo telling her what I did." FBI Director James Comey faulted Clinton in July for being "extremely careless" with her handling of classified information upon announcing the agency would not recommend charges for the Democratic nominee. He said Clinton’s "convenience" put national security at risk. This entry was posted in National Security and tagged Clinton Email Scandal, Colin Powell, Hillary Clinton, Secretary of State, State Department. Bookmark the permalink.